We are one of the leading manufacturers, exporters and suppliers of honeycomb blinds that are widely used in offices, hotels, restaurants, household, etc. 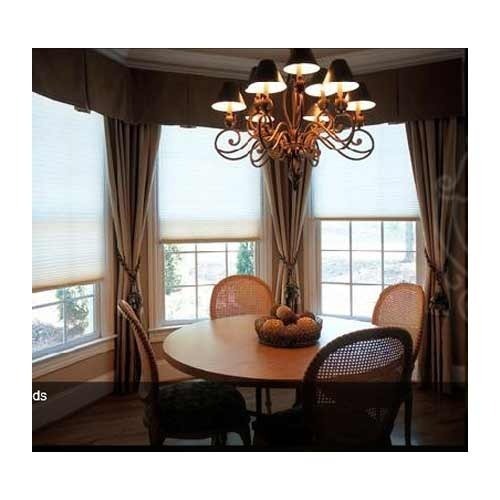 Due to the features like high durability, creative designs, elegant look, ease of cleaning, less maintenance and unique designs, these blinds are highly appreciated among our clients. In order to manufacture these blinds, we make use of cutting-edge technology that ensures perfect finish. Furthermore, these honeycomb blinds filter out uv rays that can damage interiors and decor of the building. Incorporated in the year 1994, we, “Megamode International,” are ranked amidst the noteworthy manufacturers, exporters and suppliers of an exclusive range of Specialized Window Coverings and Soft Furnishings. Our offered range includes Roman Blinds, Honeycomb Blinds, Wood Blinds, Bamboo Blinds, Roman Shades, Curtains, Cushion Covers, Table Linens, Table Linens, Bed Linens, etc. These are designed and crafted by our skilled craftsmen as per the latest market trends using high grade factor inputs and latest designing methodology. The raw material that we use to design these products is sourced from reliable vendors of the market in order to meet the international quality standards. These products are extensively demanded all across the globe due to their attractive designs, low maintenance, durability and perfect & smooth finish. We offer these products to our clients in various specifications to meet their varied requirements.